Kayla Patitucci didn’t start out in the coxswain seat, but once she found it, she knew it was the right seat for her. “I went to my first camp as a rower, but my dad suggested I try being a coxswain and he was right. 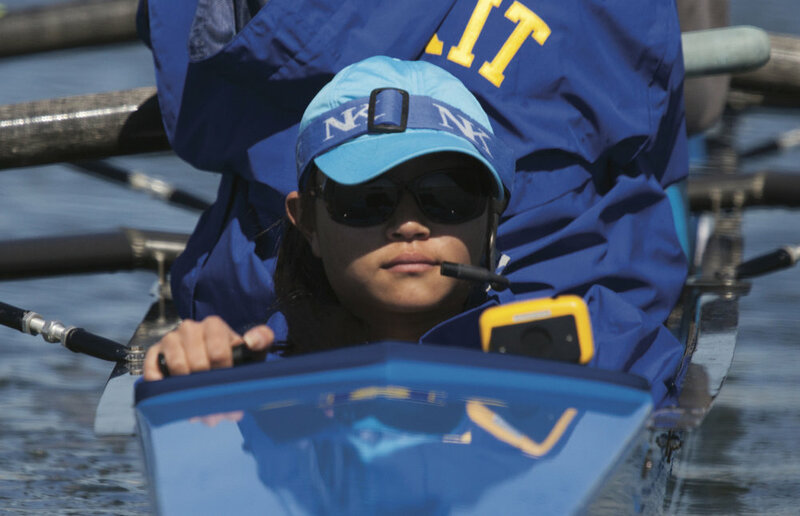 I loved it.” Patitucci, a sophomore at Holy Spirit High School in Absecon, NJ, is in her second season of coxing. “The first time I got in the coxswain seat I was incredibly nervous. All I could focus on was steering and making sure I didn’t hit anything.” Patitucci coxes for her high school crew, practicing on the inner harbor waters just north of Atlantic City, New Jersey. Glimmers of the high-rise casino buildings loom on the horizon as she navigates the saltwater inlet. Listen to what your coach is saying, and listen to your rowers. They both give me feedback about my coxing, and how to call their rowing. That’s simple. I wear an insulated cox suit, one of those big float suits that goes from head to toe. It’s hard in the Four, but I’ve gotten used to it. I try to be an inner coach, calling for trust (of the rigger-side), and to stay focused. It’s the basics, really. I always remind the rowers of what the coach has called for. I figure that can’t be wrong. It depends on what it is. I’ve learned to take charge or be loud when they need it. Coxing has definitely changed me.